Use this startup Pitch Deck template to design your own impressive pitch deck today! Today going green is important to many businesses. If you’re starting your own company and recycling plays an important role, you can pitch that to your investors with this Green Startup Pitch Deck. 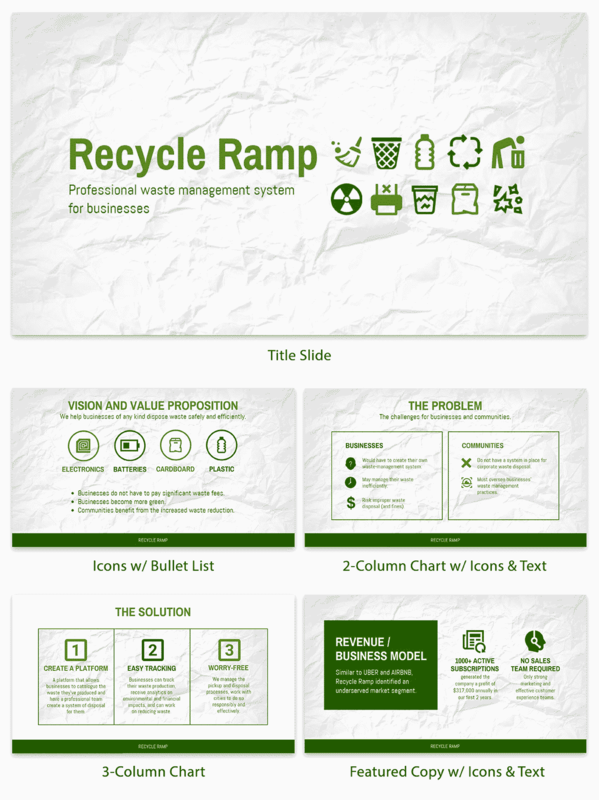 With our wide selection of recycling images and icons, you can create a Green Startup Pitch Deck template that will draw people’s attention. You can send a message and generate revenue to help build your business. The Green Startup Pitch Deck template is fully customizable and easy to modify including the text, font, icons, colors, images, charts, bullet lists, and you can upload photos. Impact your investors or sponsors and customize the Green Startup Pitch Deck template today!